The Howard Hughes Corporation (NYSE: HHC) announced Friday that it is launching sales for the reserved housing program in its newest Ward Village project, Ke Kilohana at 988 Halekauwila St. Applications will be available from Saturday, March 26 until Sunday, April 3, at the Ke Kilohana Sales Gallery in the IBM Building at 1240 Ala Moana Boulevard, open daily from 10 a.m. to 5 p.m. Completed applications must be returned in person between April 8 and April 13. Buyers will be selected in a lottery to be held April 15 via webcast, with home selection beginning on April 16 based on lottery placement and running throughout April. There are 375 reserved housing residences reserved for qualified buyers in the 43-story, mixed-use condominium high-rise. These include one-bedrooms priced from $323,475 to $442,246, two-bedrooms priced from $473,789 to $538,612, and three-bedrooms priced from $521,774 to $560,774. The tower also includes 49 market-priced residences. Competition for the reserved housing units may be stiff — Ward Village notes that more than 3,500 people attended informational seminars on Ke Kilohana in over December, January and February. Reserved Housing Application packets may be obtained from the Ke Kilohana Sales Gallery starting Saturday, March 26, 2016 at 10:00 a.m, and will be available for pickup through Sunday, April 3, 2016 at 5:00 p.m. Applications will not be available for pickup after Sunday, April 3, 2016 at 5:00 p.m. Prospective purchasers should carefully review the information contained in the Reserved Housing Application packet to determine whether all eligibility requirements are met. The earliest date that completed Reserved Housing Applications will be accepted is Friday, April 8, 2016 at 10:00 a.m. Reserved Housing Applications will not be accepted prior to this time. Applications must be hand-delivered to the Ke Kilohana Sales Gallery between Friday, April 8, 2016 at 10:00 a.m. and Wednesday, April 13, 2016 at 11:59 p.m. to be eligible to participate in the Lottery. Only substantially complete applications will be accepted. Applications delivered by email, facsimile, mail or courier will NOT be accepted. 4. Loan Pre-Qualification Letter provided by Honolulu HomeLoans or First Hawaiian Bank. Red Pineapple boutique owner, Nalani Holliday. As The Howard Hughes Corp. builds high-rise condominiums and rebrands Ward Village, its retail footprint will grow by about 60 percent, according to Ward Village Shops Senior General Manager Bobbie Lau. Ward Village Shops’ five commercial neighborhoods have more than 135 shops and restaurants, and one out of seven are locally owned businesses. The developer plans to keep that ratio, Lau says. “It’s our intention to keep that 70 percent ratio because that’s what makes us unique — the local mix, with some big boxes,” she said, noting that all high-rise condominiums will leave room for retailers on the first floor, sometimes two floors. Lau said The Howard Hughes Corp. is working with current Ward Warehouse tenants to find future spots for them in the new development. 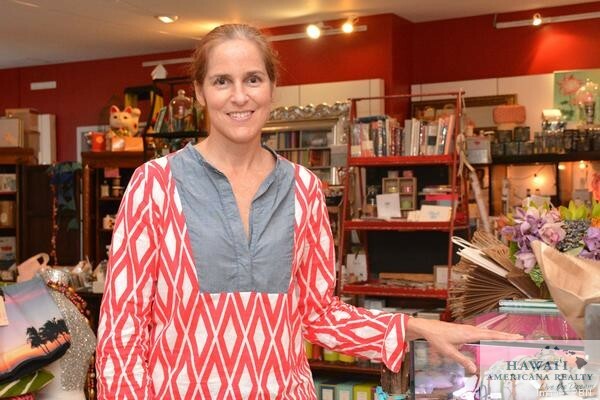 Nalani Holliday, owner of Ward Centre boutique Red Pineapple, says she believes the changes will be positive for retailers, with extra space and green, shady, family-friendly walkways. 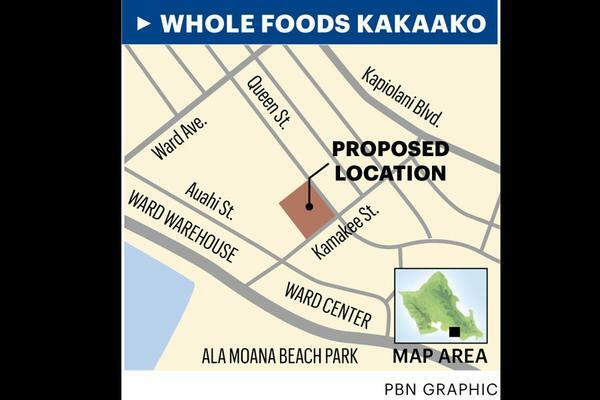 The new mixture of residents, local and foreign shoppers, and businesses will be an asset for Kakaako, she said, including the new flagship 50,000-square-foot Whole Foods Market store that is scheduled to open in 2017. Red Pineapple’s neighbor, Sedona, has been at Ward Centre for more than two decades. Sedona President and co-founder Malia Johnson said that while construction is underway at Ala Moana Shopping Center, she has seen a lot of customers returning and discovering the new shops Kakaako has to offer. She says some of the appeal is that many of the shops located at Ward and in Kakaako have just one location, including Sedona, Red Pineapple and the University of Hawaii’s Rainbowtique store. 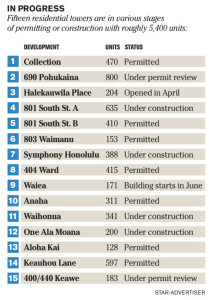 To learn more, read this week’s special report on Kakaako in the Friday print edition. For the as yet unnamed Howard Hughes Corp. Ward Villages project in Honolulu, architects with Bohlin Cywinski Jackson of Seattle are exploring perforated, creased screens for the retail/parking podium, as well as details in the residential tower’s facade, that suggest wind patterns. This rendering depicts the main entries of Whole Foods Market facing Kamakee Street. One variance sought is permission to make the retail/parking podium height 75 feet, matching that of the Anaha project to go up across Kamakee Street, on the site of the former Pier 1 Imports. “This is the best way we can offer enough parking not only for the residents, but for the customers of Whole Foods, the other retail spaces, the Ward theaters and surrounding area,” said Vanderboom. The amount of parking being sought is based in part on their observations of parking demands at Kahala Mall since Whole Foods Market opened there. A second variance seeks to orient the residential tower mauka-makai, to preserve view planes. “We believe that will make the building appear lighter and thinner,” said Miller. The theme guiding the aesthetics of the Block M project is “wind,” in contrast to the oceanic themes that influenced the Waiea and Anaha projects. “One of the things we like to do is take the invisible flows of nature and make them visible in architecture,” said Miller. Bohlin Cywinski Jackson is exploring perforated metal skins for the podium, to be creased in ways that suggest wind patterns. Details in the tower’s glass façade will carry the theme upward. Pricing has not been determined, but Vanderboom said that, with smaller units being planned, the project will likely be priced lower than Waiea or Anaha and appeal to a broader range of buyers. The project’s overall budget is not set yet at this time. The tower is currently unnamed. “We’re working with our cultural descendants to find something appropriate,” said Vanderboom.The name is also likely to play off the theme of wind. A decision on the variances from HCDA could be reached in January. Construction could begin in 2015. “We’d like to do the entire project all at once, but are looking for the flexibility to build the Whole Foods Market, retail and parking first, and the tower later, if market conditions suggest that,” said Vanderboom. Howard Hughes Corp.’s design strategy is to match a different pairing of a notable Mainland architecture firm and a local firm for each discrete project, giving variety to each tower within the context of the Ward Village master plan. The Howard Hughes Corp. plans to submit plans to the Hawaii Community Development Authority early next year outlining plans for a mixed-use project with significant commercial space that would replace the existing Marukai Wholesale Market near the Ward Entertainment Center, the head of the state agency overseeing the redevelopment of the Honolulu neighborhood of Kakaako told PBN this week. Anthony Ching, executive director of the HCDA, said that the agency expects to see plans for the project from the Texas-based developer in the first or second quarter of 2015. He declined to divulge any other details about the project. David Striph, senior vice president of Hawaii for The Howard Hughes Corp., which is in the midst of developing its 60-acre Ward Village master plan, told PBN Tuesday that the company currently does not have any information to share about a potential project at the Marukai Wholesale Market location. “We are pleased to be continuing the planning stages for phase two of Ward Village with our Ward Village Gateway and “Block M” projects, both of which move us towards our vision for an integrated neighborhood that provides a gathering place for all,” he said in an email to PBN. Ward Village Gateway, which will replace the existing Ward Warehouse shopping center with a couple of high-rise towers and street-level commercial and recreational space, won approval from the HCDA late last month. The developer’s “Block M” refers to the Whole Foods Market project at the site of the former Nordstrom Rack store and current Office Depot, which will include a residential tower as well as additional retail space. The HCDA is holding a decision-making hearing on this project on Jan. 7 at noon at its office at 461 Cooke St. in Honolulu. The Howard Hughes Corp. plans to redevelop Ward Centers in Kakaako into Ward Village over the next decade. The plan for the 60 acres includes adding 4,000 high-rise residential units and more than a million square feet of retail and commercial space, as well as open spaces and pedestrian-friendly streets. Ward Village has received LEED Neighborhood Development Platinum certification, making the Honolulu project the nation’s largest LEED-ND Platinum-certified project and the only LEED-ND Platinum-certified project in the state. 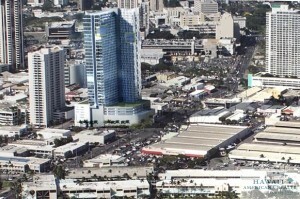 The company has the development rights for 22 high-rises in Kakaako. This rendering shows The Howard Hughes Corp.’s planned 424-unit, mostly affordable condominium at 988 Halekauwila, part of the developer’s Ward Village master-planned community. The Howard Hughes Corp. is temporarily withdrawing its petition dealing with reserved housing units on its 424-unit residential tower planned for 988 Halekauwila in Honolulu’s Kakaako neighborhood as part of the first phase of its Ward Village master plan. The Howard Hughes Corp. (NYSE: HHC) said that 375 of the total number of units will be offered at prices lower than the market-rate luxury condo towers. “This rule clarification in no way changes our commitment to build 375 reserved housing units at 988 Halekauwila, nor does it change our strong commitment to creating a diverse community at Ward Village with an array of housing options and price points, including affordable and market-rate housing,” Randle said. The developer noted in its second quarter earnings report that it is finalizing plans for this project, and that as of June 30, it has spent $3.8 million on developments costs on the project, which will be located on what is the former site of the Kanpai Bar & Grill and the current California Rock ‘N Sushi. The project also will include six levels of parking and about 23,000 square feet of retail space. Kakaako is in the middle of a residential tower development wave that builders see as meeting overwhelming homebuyer demand, but some area residents see as crowding their quality of life. Well, don’t look now, but another wave is on the way. Three developers have unveiled plans to seek permits later this year for six more residential towers in or on the edge of Kakaako with more than 1,000 new units. Four of the new towers are part of the Ward Village master plan by Ward Centers owner Howard Hughes Corp. One is part of the Our Kakaako master plan by Kamehameha Schools. 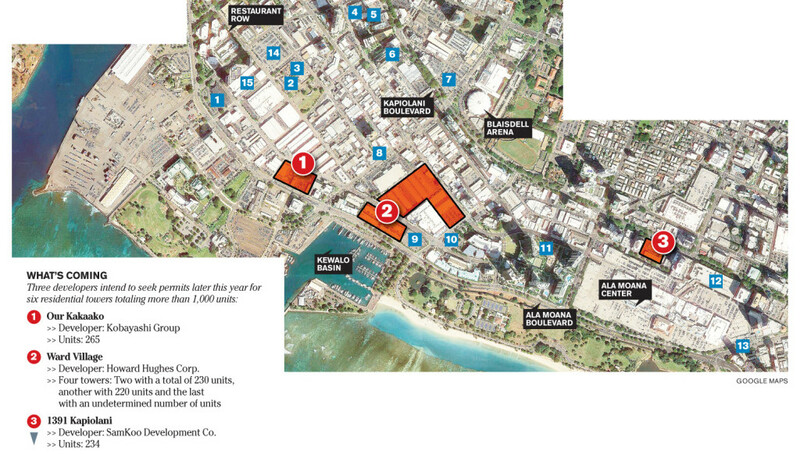 And one is adjacent to Ala Moana Center and the city’s planned rail station there. 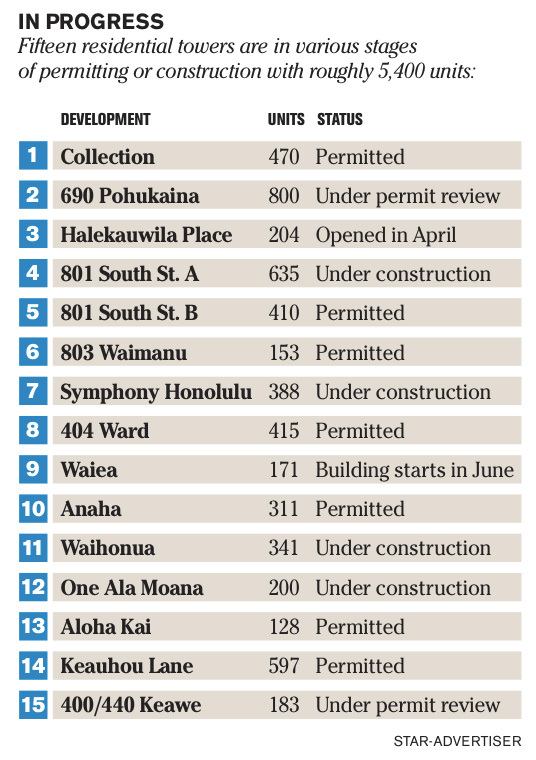 The six new projects are on top of 15 towers in or on the outskirts of Kakaako with a combined total of roughly 5,400 units under construction, permitted, in permitting or recently completed. Local housing market analyst Ricky Cassiday said the newest tower plans reflect an eagerness by developers to meet market demand and perhaps get projects approved before state lawmakers have an opportunity next year to change Kakaako development rules in response to public outcries as they did earlier this year. Local economists have said that Hawaii population growth is outstripping housing production, and that even 5,000 condominiums delivered over the next two years will make only a dent in the shortage. Far fewer homes are being built elsewhere in Honolulu — mainly single-family houses and townhomes in the suburbs — making Kakaako ground zero for housing production on Oahu. Eugene Tian, the state’s chief economist, recently said that 3,525 new homes need to be added on Oahu annually to match an anticipated population growth of 1 percent, assuming 2.8 people per household. Over the past three years, 1,612 residential units were approved for construction per year on average, which leaves a deficit of 1,913 homes. “We are behind,” Tian said. Cassiday agrees that there is strong demand from residents forming families, though he also said added demand is coming from part-time residents and investors outside Hawaii. 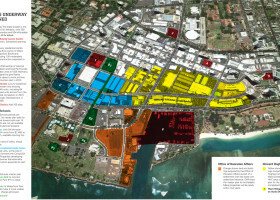 The most aggressive developer in Kakaako responding to such demand appears to be Hughes Corp. with its Ward Village plan that envisions up to 4,300 residential units in 22 towers covering 60 acres at Ward Centers. Hughes Corp. has three towers with 915 combined units already approved and slated to begin construction later this year. On Tuesday, the company told the Ala Moana-Kakaako Neighborhood Board that it plans to seek permits later this year for another four towers. Two of the new Ward Village towers have a combined 230 units, including some low-rise townhomes, and replace most of Ward Warehouse along Ala Moana Boulevard. Another tower with 220 units would be just Ewa of the Ward Entertainment Center theaters. A fourth tower with an undetermined number of units is planned next to a recently announced Whole Foods store mauka of the theaters. This four-tower second phase of Ward Village also includes retail and a large landscaped pedestrian plaza around which the four towers are planned, according to Nick Vanderboom, vice president of development for Hughes Corp.
“This will be the start of what will be about a 4-acre village green connecting Kewalo Basin up to where the future rail stop will be near where Ross is today,” he told the board. a couple of blocks away, Kamehameha Schools is working with local development firm The Kobayashi Group to build a 265-unit tower on a 3.5-acre site occupied by Cutter Nissan between Ala Moana Boulevard, Koula Street and a closed-off portion of Auahi Street. Matthew Pennaz, a Kobayashi Group senior project manager, speaking at the same neighborhood board meeting on Tuesday, said the company considers the block the “crown jewel” of nine blocks in the Our Kakaako master plan. “We’re excited to be part of the community,” he said. Pennaz said a price range for tower units hasn’t been determined yet. Cassiday, however, said a tower on that site most certainly would be a luxury product. Both the Our Kakaako tower and Ward Village towers will need approval from the Hawaii Community Development Authority, the state agency regulating development in Kakaako. Existing residents in the area, many of whom live in condos next to proposed towers, have complained about the agency “rushing” public hearings on tower permits over the past couple of years, and contend that more towers can’t be supported by infrastructure such as roads and sewers. 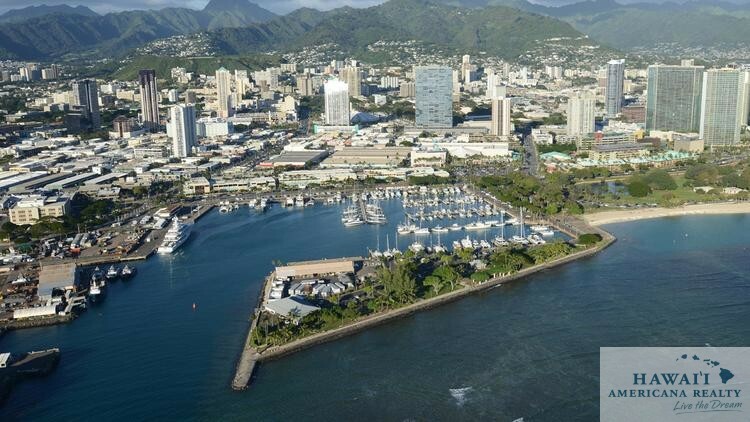 HCDA officials insist that sufficient sewer capacity was created to handle all the proposed development under a 4-decade-old vision to concentrate dense urban development in Kakaako that relieves pressure on rural and agricultural lands on Oahu. The city considers sewer and water connection requests per project, and has approved all of them to date. The developers will need to produce traffic studies and mitigation plans. The projects are likely to slow traffic in the area, but not to an extent that would keep them from proceeding, based on past decisions regarding other developments. The issue of rapid development in Kakaako led to several bills introduced in January at the Legislature, including one calling for a moratorium on development in the area and one abolishing HCDA. Only one bill passed, and will reconstitute the agency’s board of directors next year among other more minor changes. Larry Hurst, area neighborhood board chairman, is supportive of HCDA’s mission established by the Legislature in 1976. The third new project presented to the neighborhood board Tuesday is a 234-unit tower slated at 1391 Kapiolani Blvd. next to Ala Moana Center a block Ewa of the Nordstrom store fronting Kapiolani, Kona Street and Kona Iki Street just outside Kakaako’s Piikoi Street border. In 2007, an affiliate of South Korea-based SamKoo Development Co. Ltd. bought the 1.4-acre site that formerly hosted a car dealership and announced plans for a luxury condo tower. 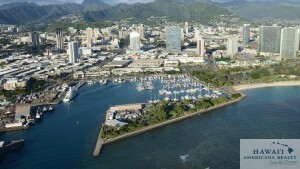 However, Hawaii’s real estate market was approaching a turndown in the face of a recession and the project was put on hold. Lowell Chun, a consultant for SamKoo, told the board that the developer has revised its plan to fit with the city’s new rail station that will be the Honolulu terminus of the line from Kapolei. Chun said SamKoo is offering to provide a slice of its property along Kona Street for rail use, and would like to create a public area with commercial shops on the tower site integrated with the city’s rail station. Chun said SamKoo hopes to submit a permit application with the city within the next few months under interim transit-oriented development rules pending before the City Council, provided the rules are adopted. A maximum height under interim rules being considered would be 450 feet, up from the site’s existing 250-foot limit, though Chun said the 1391 Kapiolani tower is planned to rise 420 feet. The Neighborhood Board did not vote on the projects. Developers of the three projects all expect to seek permits this year but did not project construction timetables if their towers are approved. 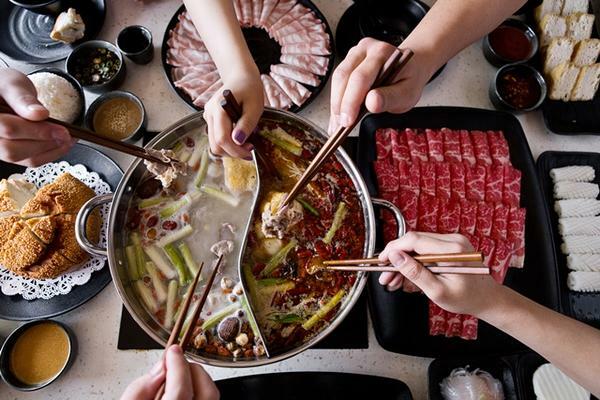 Little Sheep Mongolian Hot Pot, opening Friday in the former Grand Leyenda Cantina space at Ward Centre is one of five new tenants opening at Honolulu’s Ward Centers in the next two months. Five new tenants are preparing to open their doors at Ward Centers in Honolulu, adding a mix of eateries and clothing retailers to the shopping center that is being transformed into the master-planned community called Ward Village. Three of the five new tenants are opening by the end of May, beginning with Little Sheep Mongolian Hot Pot, opening Friday, located above Genki Sushi at Ward Centre in the former E&O Trading Co. space. Other tenants opening by the end of May include Waiola Shave Ice, which is planning its third Hawaii location at Ward Warehouse across from Dairy Queen. in the former Island Gold Collection space. Also opening this month is The Monarch Tea Room, which will be located inside Na Mea Hawaii Native Books at Ward Warehouse. Next month, And More By Local Fever — Jeans Warehouse Inc.’s largest store spanning 20,000 square feet of space — will offer fashion, home, accessories and more with 15 different departments, located in the former Nordstrom Rack location next to Office Depot. Later this summer, Big Island Delights will relocate its location from Ward Centre to Ward Warehouse, located in the space formerly occupied by C. June Shoes. The Howard Hughes Corp. (NYSE: HHC), which owns Ward Centers, is also developing the master-planned Ward Village community, where two mixed-use residential towers — Waiea and Anaha — will be built in the first phase. Early in May, The Howard Hughes Corp. said that it reached contractual agreements for about half of the 482 units in its two ultra-luxury high rises that began pre-sales in February. Construction of the Anaha and Waiea towers is on track to break ground this summer, as PBN reported. 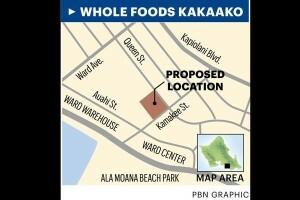 The proposed location of Whole Foods Kakaako is on the corner of Queen and Kamakee Streets. 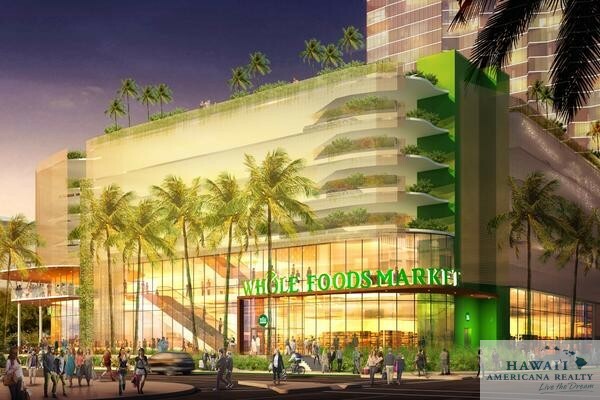 The flagship Whole Foods Market planned for Ward Village in Honolulu’s Kakaako neighborhood will be part of a new mixed-use development by The Howard Hughes Corp. that will cover the entire block at Queen and Kamakee streets, a company spokesman told PBN. Nick Vanderboom, senior vice president of development for the Texas-based developer, who is based in Hawaii, told PBN that construction of the retail and residential spaces may be done in phases. He said he could not provide more details about the residential component, which likely will include high-rise condominiums. The project would be in addition to the two ultra-luxury condominium high-rises— Anaha and Waiea — that are being planned for the area and also are being developed by The Howard Hughes Corp.
On Tuesday, Whole Foods Market said in its quarterly earnings report that it will open a fourth store in Hawaii, and its third on Oahu, as part of its future growth and development plans throughout the U.S. The new Honolulu store will be located in the space currently occupied by an Office Depot and a former Nordstrom Rack behind the Ward Theatres complex. The 50,000-square-foot store, which will be the company’s largest location in the state, is slated to begin construction next year and be completed in 2017. Last year, The Howard Hughes Corp. began the transformation of Ward Centers into Ward Village, an urban master-planned community that will include approximately 4,000 residential units and more than 1 million square feet of retail and commercial space. 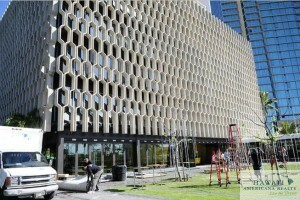 Workers prepare for a private grand opening of the newly renovated IBM building. The Howard Hughes Corp. on Friday unveiled its $24.4 million redevelopment of the iconic IBM Building in Honolulu, which is now an information center and residential sales gallery for the Texas-based developer’s Ward Village master plan in Kakaako. The plan is to open the center to the public on Jan. 31, Nick Vanderboom, senior vice president of development for The Howard Hughes Corp., told PBN. Click on the photo for a slideshow. “The IBM Building is a perfect example of The Howard Hughes Corp.’s long-term commitment to blend our respect for Hawaii’s unique and rich history with our vision for Ward Village as a vibrant, environmentally sustainable, integrated community,” Vanderboom said in a statement. The IBM building, which was originally designed in 1962 by famed famed Hawaii architect Vladimir Ossipoff, is part of the developer’s first phase of its Ward Village plan that includes its first three residential towers, The renovation preserved the tower’s distinct concrete brise-soleil and included complete interior renovations of the first, second and sixth levels of the building. 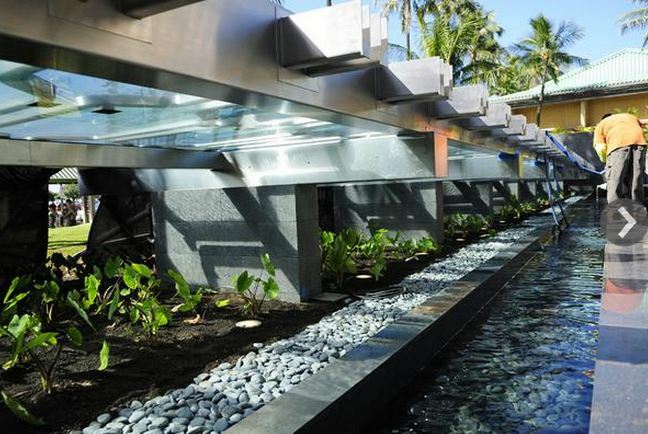 The redevelopment also included an addition to the seventh-floor rooftop, an open air lanai addition to the ground floor and an upgrade of the site’s hardscape and landscape, eliminating parking to create a courtyard, a Native Hawaiian Garden and community space on the makai side of the building. The ground floor, which houses the Ward Village master plan information center, features an original wall mural by Native Hawaiian artist Solomon Enos, an interactive exhibit created in partnership with the Bishop Museum showcasing the history of the Ward area, demonstrative displays and models that show details of the planned 60-acre project and a theatre open to the public to watch a film about Ward Village. The ground floor also will include a restaurant, which will overlook the makai courtyard and a water feature. David Striph, senior vice president of Hawaii for The Howard Hughes Corp. (NYSE: HHC), told PBN that it is talking to potential tenants for the space, but that no decision has been as to who will lease that space. 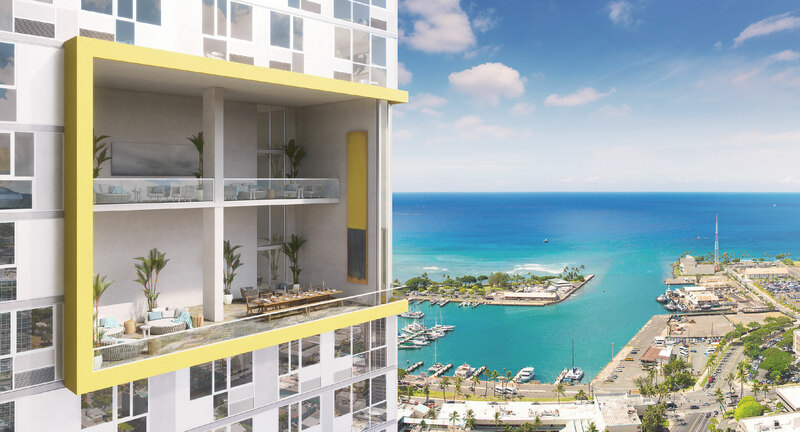 The sales gallery, which is located on the sixth floor, has complete model units for the first two planned mixed-use condominium towers, Waiea at 1118 Ala Moana Blvd. and Anaha at 1108 Auahi St. Sales for both condos are expected to begin in early 2014, the developer said.